Quitting a nanny job is never easy. It’s a hard transition for everyone involved, and often is seen as a personal betrayal to the parents you work for. When parents feel this way, that betrayal can be like a dark cloud hovering over the wonderful services you’ve provided in the past. It can not only damage the relationship, but also hurt the reference they provide to prospective employers. Luckily, there are some things you can do to make this time easier and less stressful for your employers. Taking these measures will show them that even though you’re leaving, you still care about their family and want to help them in any way possible. That commitment can ease the transition and help you get the positive reference you’ve earned. Give a clear reason for leaving. 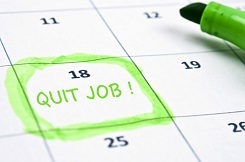 Sometimes the reason you’re quitting your job is very simple. Maybe you’re moving to a different area, which makes your current commute too long. Or perhaps your charge is entering school and you want to care for an infant again. Other times, however, the reason isn’t so cut and dry. There may be several issues that factor into your decision to leave. Maybe Mom is consistently late, Dad keeps asking you to do things outside your job description, and despite multiple conversations the parents don’t support your discipline approach. Whatever your reason is, it’s important that you clearly and calmly explain it to your employers. Your family deserves to know why you’re leaving and having a solid reason can help them move through the transition period easier. Give an appropriate notice period. If you have a nanny contract, the length of your notice period should be detailed there. If you don’t have a contract with your family, it’s standard to give 2 to 6 weeks’ notice. Because it can take up to 8 weeks to find a new nanny, your family will appreciate receiving as much notice as you can give. Giving them time to find a replacement caregiver and helping the kids get used to the idea of a new person shows your commitment to being a professional even during difficult times. Understand this is an emotional time for the family. Even if leaving is the best decision for you and the family, this is a tough time of transition. Your employers may be angry, sad, frustrated, or defensive, even if they understand why you’re leaving. Working together may be uncomfortable, but staying until the end of your notice period will reflect well on you and may become a highlight of your reference letter. Offer to help the family find a replacement. When you quit, your family will be facing two big hurdles: dealing with your departure and finding a replacement. For many families, it’s an overwhelming time. By offering to help with finding your replacement, you can relieve some of the pressure they’re under to find a new nanny. Creating a job description, going through resumes and finding matching candidates, or sitting in on the interview are all ways you can help. You offer parents a unique perspective into what type of caregiver would fit best with their family and that input can be invaluable. Work with the parents to help the kids transition to a new caregiver. Leaving a nanny position is hard on everyone, especially the kids. It’s helpful for you and the parents to work together to help the kids understand why you’re leaving, how your relationship will change and what will happen next. The support you offer during this time will be a big factor in how well the children are able to move on and welcome a new nanny. Train the new nanny. Helping the new person get acclimated to the job will help her, your employers and your charge. It will give you a chance to detail your charge’s daily schedule, show her where things are located in the house and introduce her to the school, grocery store, playground and other frequent stops in the neighborhood. This is the perfect time for her to learn all the tricks of the trade you’ve discovered during your time with the family. It also helps ease the transition since she won’t be starting from ground zero on her first day. Prepare a nanny book. One of the final things you can do for your family is to create a nanny book for the next caregiver. This book puts together all the details needed to be efficient on a day to day basis. It could include your charge’s daily schedule, sample menus, phone numbers of playmates, a list of often used repairmen and anything else you think would be helpful to the new nanny.